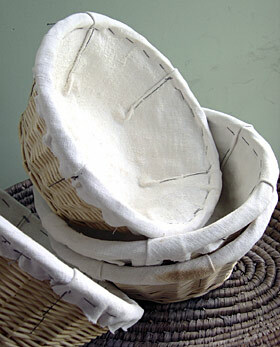 Wilkinsons sell cotton-lined bread baskets for 99p each in oval, round and baguette shapes and I used these to make my bannetons, removing the linings that came with them as I wanted a more authentic, traditional look. Any shallow basket with slightly sloping sides will do. Traditionally bannetons are lined with linen and this fabric has particular characteristics that makes it the ideal fabric to use. It is very absorbent and has a lovely texture, which if pronounced enough leaves a slightly embosed pattern on the surface of the loaves. 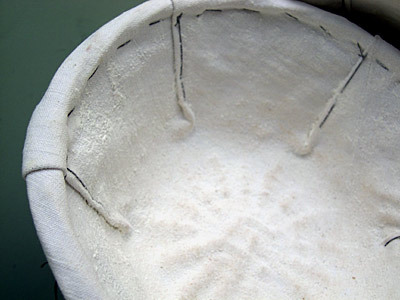 It is essential to dust the linen liberally with flour before use and it might take a few goes to know just how much you will need to stop the dough from sticking. I’m sure that cotton, hemp or linen / cotton mixtures will work as well but choose a fabric with no threads or lint on the surface and pure linen if you can. I just happened to have some vintage French linen sheeting which I used to make mine but am aware that not everyone will have some hanging around the house. Use old clean linen teatowels, perhaps printed with maps of New Zealand or Hawaii to make some really funky bannetons but remember that with regular dustings of flour continents may become lost in time. You will need: a basket; a piece of linen bigger than the basket; some pins; a long, sharp and sturdy needle; cotton thread; some scissors. Place your piece of fabric inside the basket and push it down into the base so the fabric sticks up above the top of the basket. The fabric needs to be deeper than the basket sides so when it rolls over the basket rim there will be an extra 1cm (1/2 in) to spare under the rim. If you are feeling confident cut the fabric straight away or draw a line all the way around first using a pencil before cutting. With the fabric flat against the base make shallow pleats in the fabric, six evenly spaced should do the trick, so it rests flush inside the basket and pin them in place. For an oval basket make the pleats in 2 groups of 3 towards the curved ends to make the arrangement nice and symmetrical. Roll the linen over the basket rim, keeping the pleats folded and push pins through the fabric into the basket to hold it in place. Thread the needle with double cotton thread and knot the ends together. Start to stitch under the rim on the outside of the basket, beginning with a couple of small stitches in the fabric, then make 15mm (1/2 in) running stitches all the way round the basket, pushing the needle in and out through the weave and the fabric to hold everything together. It doesn’t have to be perfect and neat. Remove any pins around the rim as you go. Stitch the first pleat in place beginning on the outside of the basket under the rim and starting the thread with a couple of stitches. Then push the needle through the basket weave and the fabric to inside the basket so the needle emerges a few millimetres (1/4 in) in from the fold of the pleat. Make one long stitch to halfway down the pleat, pushing the needle back through to the outside of the basket. Push the needle back through to the inside of the basket near the bottom of the pleat, then push the needle back through the centre of the pleat. Thus, each pleat is held in place by long stitches worked in a figure of eight sequence. Fasten off the thread under the rim. Stitch the other pleats in place in the same way and remove any pins. Your banneton is now complete and ready to give you years of use.